The North Shore is a region in the U.S. state of Massachusetts, loosely defined as the coastal area between Boston and New Hampshire. The region is made up both of a rocky coastline, dotted with marshes and wetlands, as well as several beaches and natural harbors. The North Shore is an important historical, cultural, and economic region of Massachusetts. It contains the cities of Salem, known world-wide as the site of the Salem Witch Trials; and Gloucester, site of Sebastian Junger's 1997 creative nonfiction book The Perfect Storm and its 2000 film adaptation. Beverly was home to author John Updike until his death. The region also prominently figures in the works of Nathaniel Hawthorne, H. P. Lovecraft, notably The Shadow over Innsmouth, as well as those of many New England poets, from T.S. Eliot to Robert Lowell. Martin Scorsese's 2010 feature film Shutter Island, set on a fictional Boston Harbor island, was partly shot on location on the North Shore. The North Shore has no fixed definition as a region. It may include only those communities between Boston and Cape Ann, as defined by the Metropolitan Area Planning Council (whose purview does not go beyond Greater Boston); or the larger part of Essex County, including parts of the Merrimack Valley, as defined by the North Shore Chamber of Commerce. 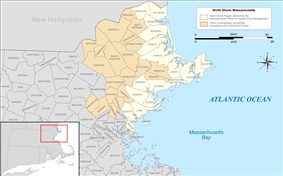 The Massachusetts Office of Coastal Zone Management, which defines regions in terms of watershed, refers to the North Shore as the coastal region of Massachusetts north of Boston stretching from Salisbury to Revere, including the inland city of Amesbury. 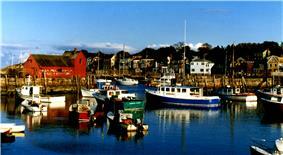 Fishing boats in the harbor of Rockport, Massachusetts. The North Shore has historically been viewed as a wealthy, exclusive collection of towns and fishing villages, but also contains some working-class cities and suburbs of Boston. In 1893, the New York Times described the region as a notable summer destination for the socialites, politicians, and businessmen of New York and New England, dotted with hotels, cottages, and burgeoning gentlemen's clubs. Salem, known worldwide as the location of the Salem Witch Trials; the working-class fishing city of Gloucester; and the region's many beaches make it a popular tourist destination. The North Shore communities have varied and rich histories: Gloucester was America's first fishing community; Salem was the location of the infamous Witch Trials as well as one of the largest centers of shipping and sixth largest city in early America. The hysteria that led to the Witch Trials began in the part of Salem that is now present-day Danvers. Lynn was once the center of the American shoe industry. Saugus is home to the first integrated ironworks in North America. Peabody had the largest concentration of leather tanneries in the world; and Beverly and Marblehead often dispute over which town was the birthplace of the American Navy. Newburyport was well known for producing clipper ships and for a brief time in history was the richest city in the Union; it is also the birthplace of the United States Coast Guard. 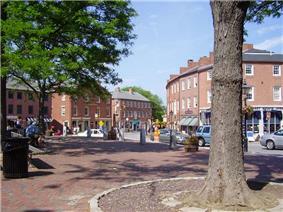 Newburyport maintains the largest collection of Federal period commercial and residential architecture in the nation. Market Square in downtown Newburyport, Massachusetts. The Peabody Essex Museum – a museum with large collections of maritime artifacts and Asian art. The Swampscott Fish House – the oldest active fish house in the country. The Cabot Street Cinema Theatre in Beverly is home to Le Grand David, the world's longest-running resident stage magic show. closed as of 2013. Reopened late 2014. ^ Metropolitan Area Planning Council. "North Shore Task force". MAPC.org. Retrieved 2011-03-09. ^ North Shore Chamber of Commerce. "North Shore Chamber of Commerce: Community Profiles". Northshorechamber.org. Retrieved 2011-03-09. ^ Massachusetts Office of Coastal Zone Management. "CZM's North Shore Region". Commonwealth of Massachusetts. Retrieved 2011-03-09. ^ Simon, Stephanie (2011-02-18). "Massachusetts's North Shore". The Wall Street Journal. Retrieved 2011-03-10. ^ Baker, Jeff (2011-03-05). Townie' review: Pieces of a shattered childhood by Andre Dubus III"'". The Oregonian. Retrieved 2011-03-10. ^ The New York Times (1893-09-03). "On the Famous North Shore". New York Times. Retrieved 2011-03-09. ^ Massachusetts Office of Travel and Tourism. "North of Boston at a glance". Commonwealth of Massachusetts. Retrieved 2011-03-09. Garland, Joseph E., Boston's Gold Coast : the North Shore, 1890-1929, Boston, MA : Little, Brown & Co., 1981.